If you like Doctor Who and swimming then this women’s swimsuit is what you want. The swimsuit almost looks like a one piece but it is not it’s two pieces and the top and bottom are sold separately so that you can mix and match and make it fit perfectly for your body. The bikini top looks like the doors of the Tardis with a ruffle on the bottom and you can choose to wear it with the spaghetti straps or strapless. The bikini bottoms show mainly gears against a blue background but on the back, you will also find the Doctor Who logo. 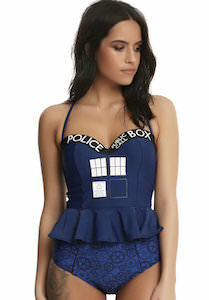 So now swimming will be extra fun this summer all thanks to this Tardis swimsuit. If you are looking for a Tardis one piece swimsuit then you can stop looking because we found the perfect swimwear for a Doctor Who fan like you. This is a one piece bathing suit that shows on the front and the back the doors of the Tardis and yes that makes this a blue swimsuit. Now even at the beach or at the pool people will know that Doctor Who is what is on your mind and of course you will make new friends that like Doctor Who as much as you do. No more plain boring swimwear for you because you can wear the Tardis to the pool. 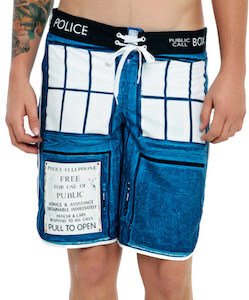 If you are a man that likes Doctor Who and need some swim shorts then you are in luck. 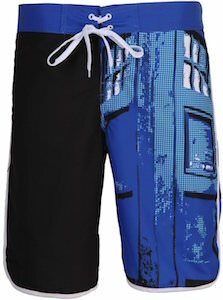 These board shorts are for the Doctor Who fan that does not need to have it obvious. The waistband is blue with a white string and one of the legs is black while the other is covered in a picture of the Tardis. But the Tardis part is limited making it not all to clear for non Doctor Who fans. Now you can enjoy the beach and pool and maybe make some new Doctor Who friends while you are at it. 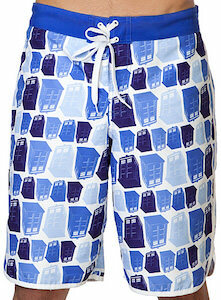 Take a closer look at these Doctor Who Tardis Half Way Men’s Board Shorts. If you are waiting and waiting for the Doctor to arrive then maybe becoming the Tardis could help. Now you can be the Tardis at the beach or pool as this is a Tardis bikini. The bikini top looks like the windows from the Tardis and the bikini bottoms are Tardis blue and have the “Police public call box” sign on the top. A piece of women’s swimwear as fun as this of course is something every Doctor Who fan wants to see. Why go for plain and boring when you can go to the beach in Doctor Who style? A true fan of the Doctor of course deserves a special piece of swimwear and this maybe the one. This one piece women’s bathing suit looks like the Tardis. Just imagine the looks at the beach and the pool as you walk around like the travel device of the Doctor. 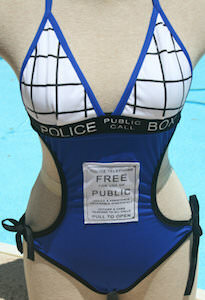 This Doctor Who swimsuit is Tardis blue with black edges and the bra cups are white with lines that look like the windows and below that the famous top sign that says “Police Public Call Box” witch you can also find on the back. And then in the middle of the bathing suit there you find the famous door sign of the Tardis.